In the remote chance you have not noticed yet, there’s been a color theme to my posts as of late. Two posts ago I sang the blues, last posts focused on the royal color and tonight’s feature brings you Mr. Yellow with just a pinch of chestnut. 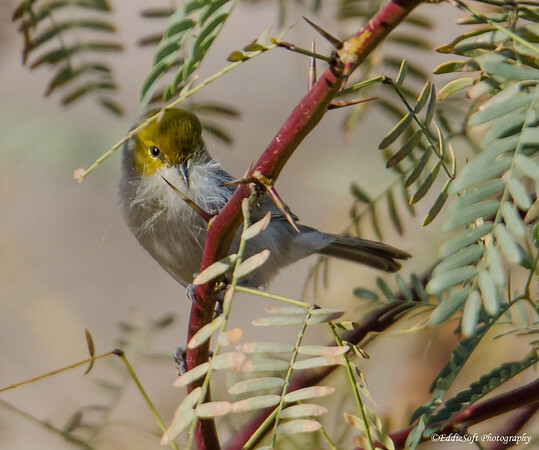 This cute bird before you is called a Verdin and happens to be the second time it has been featured here at Intrigued. The previous time was back in 2013 when I recounted the spoils from our trip to the Henderson Bird Viewing Preserve located near Las Vegas, Nevada (link here). Just happens to be the exact same location this specimen comes to you from thanks to a quick trip back there last November. 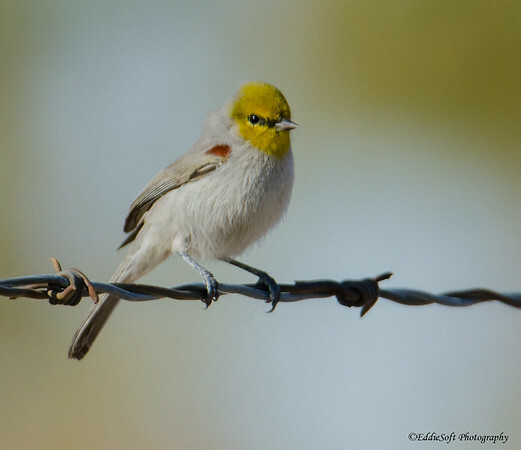 The Verdin is one of those birds that doesn’t take a lot of time pouring through reference books to identify. Their bright yellow heads are pretty distinct especially in the way it looks like they didn’t see the wet paint sign. I was lucky enough to catch some nice angles revealing the chestnut on the shoulder. This patch is not always visible as you will see in an image near the end. One thing I have noticed is these delicate looking birds have a passion for hanging around sharp objects. If they are not resting on barbed wire, they can usually be found in the middle of thorn bushes. Cornell also confirms their preferred habitat is “thorny vegetation” – check. The intriguing thing about this songbird is it seems every time I encounter them, they are either building or improving on an existing nest structure. 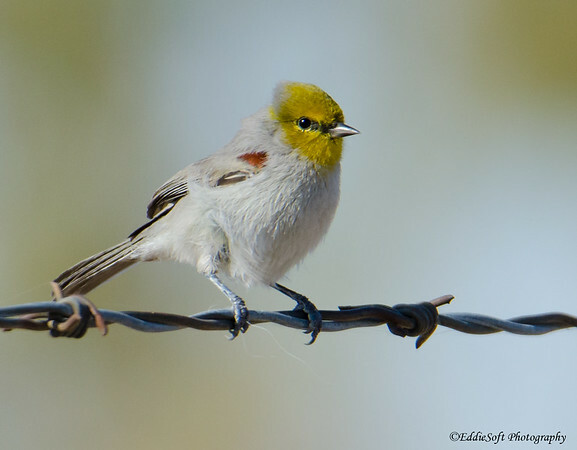 The previous set had images of the Verdin with nest material similar to our recent visit. A little bit of research revealed the answer – this species builds nest for breeding and for roosting all year round. Seems these birds hold something in common with me – the dislike for the cold. They insulate their winter roosts allowing them to escape the cold desert nights. During the summer they use their roosts to escape the heat being sure to engineer their opening toward the direction of cooling winds. I left the weaker shot above in as an example of when the chestnut patch isn’t as visible – also gives a slightly different angle for Ron. Adult females and males look similar making it difficult to tell them apart except for one clue provided in their bio. The male is responsible for the intricate latticework on the exterior where the females concentrate on the interior. Solely based on the image in the tree above, believe this is the female as it is carrying lining material. This specimen was not exactly thrilled I was hanging out in the area. It would fly in, flutter about for a few seconds and then dash away. The mystery was solved when a quick scan of the area located the nest. 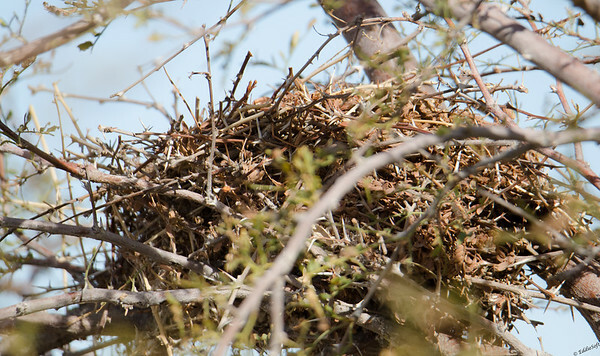 Cornell describes their nests as a large sphere with a stick outer shell and an entryway near the bottom. This nest was definitely a combination of highly entwined sticks (most of which was the same branches with the thorns noted above). The nest is less sphere-like that the one described, however, I did move to a non-threatening position, but kept an eye on it to confirm this was the destination for the material – could have been a ruse to confuse me – ‘dem Verdins are smart like that ha!. Not the multitude of pictures as the Costa’s so better get this post wrapped up. Two final tidbits to share. First off, these songbirds hang out in a narrow band in the Southwest and down into Central America. 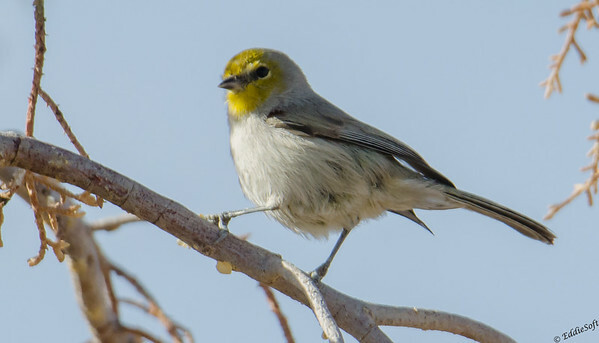 Sad to relay the Verdin possesses a Step Decline conservation status. They have been losing 2% a year from 1966 to 2014 for a cumulative loss of 65% – not good. Cornell does not provide stats for the last 5 years so unable to provide any insights on whether this has been stabilized or not. Note, Wikipedia has them listed as Least Concern, but I put more trust in Cornell than I do that site (to be honest, I am skeptical of most things on Wikipedia based on the political bias that runs rampant on that site). That’s all for tonight folks – time to go bundle up with a nice cup of cocoa.- be sure and let me know if you like the first or third image better – bouncing back and forth between those two so opted to leave them both in.